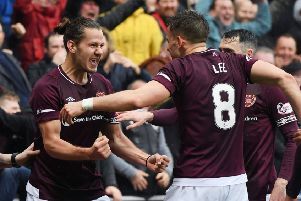 Hearts will play fellow Premiership club St Johnstone in the second round of the Betfred Cup. The Jambos will face the Saints at McDiarmid Park on either Tuesday, August 9 or Wednesday, August 10. St Johnstone qualified top of Group B in the first round with ten points from a group that included Falkirk and Stirling Albion. Full draw: Rangers v Peterhead; Dundee United v Partick Thistle; Celtic v Motherwell; Hamilton v Morton; Hibs v Queen of the South; St Johnstone v Hearts; Alloa v Inverness; Ayr v Aberdeen.